To appear in: Proceedings of the 2019 CHI Conference on Human Factors in Computing Systems Extended Abstracts. ACM, 2019. Multi-device environments have an enormous potential to enable more flexible workflows during our daily work. At the same time, visual data exploration is characterized as a fragmented sensemaking process requiring a high degree of flexibility. In my thesis, I am aiming to bring these two worlds into symbiosis, specifically for sensemaking with multivariate data visualizations and graph visualizations. 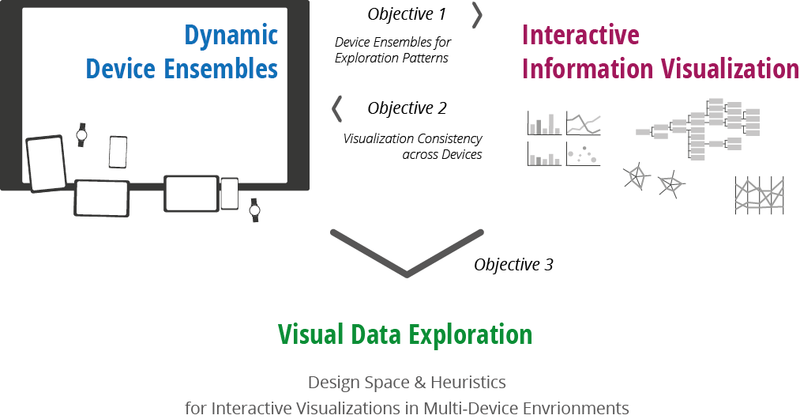 This involves three main objectives: (i) understanding the devices' roles in dynamic device ensembles and their relations to exploration patterns, (ii) identifying mechanisms for adapting visualizations for different devices while preserving a consistent perception and interaction, and, finally, (iii) supporting users and developers in designing such distributed visualization interfaces, e.g., through specific guidelines. As specific contributions, it is planned that (i) and (ii) emerge into a design space, while (iii) leads to a set of heuristics. So far, I was able to extensively work on the first objective as well as to touch on the other two. This extended abstract is part of my participation in the Doctoral Consortium at the ACM CHI conference in Glasgow, Scotland in May 2019.